By understanding how the interview works and, crucially, what it is that the interviewer is looking for. The interviewer is not looking to catch you out, but rather for you to demonstrate your curiosity, knowledge and passion for Engineering. The easiest way to demonstrate your enthusiasm for Engineering is to show that you are self-motivated and have studied the subject in your free-time for enjoyment – for example through online lectures and independent reading. If you don’t know where to start, review our suggested reading list below. Each guide discusses ten Cambridge Interview Questions in depth with answers and approaches – along with possible points of discussion to further demonstrate your knowledge. They have been specially edited for applicants for each subject by a team of Oxford and Cambridge graduates. 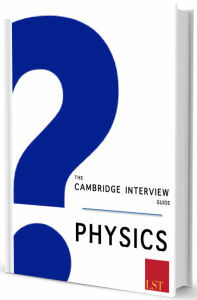 Please Note: Currently “The Cambridge Interview Guide” is available for Chemistry and Physics (available to download below). Other subjects will be available for download in November – please enter your email below to receive a notification when your subject guide is available for download. Click below to receive your Cambridge Interview Guide right now and you’ll be sent it in PDF format by email the same day so you can begin your preparation right away. 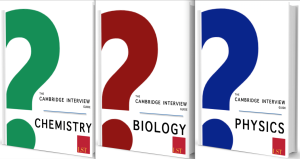 The Cambridge Interview Guides are available to download for only £30 each. Click the button below to receive your Cambridge Interview Guide right now! If you had a cylinder, sealed at both ends, with the pressure rising inside, would it blow at the end or split along the side first? Sketch a velocity time graph for a skydiver jumping out of a plane. A rectangular sheet dimensions a x b is to be made into an open-topped box by cutting a square of side h from each corner and folding the 4 sides up. Find the value of h which allows the maximum volume of the box? Why do sausages split lengthways, rather than around the circumference? How small can you make a computer? What are the limiting factors? What are the main differences between the engines in jet fighters and the engines in jet airliners; which type of engine is the more efficient, and (qualitatively) why? How would you design a gravity dam for holding back water? What would happen if you drilled through the Earth all the way to the other side and then jumped into the hole? Why did they used to make the mill chimneys so tall? Explain the following to someone with no knowledge of physics: force, momentum, power, work. What are the fundamental differences between Engineering and Physics? If I am in a room with 5 people and guess all their birthdays what is the probability of getting (only) one correct? Are bridges more stable on concrete or on soil – why? Derive the equation that links voltage, charge and capacitance. How do aeroplanes fly? Why can some fly up-side down? How do trains go around bends? How does an aeroplane stay airborne and how can some aeroplanes fly upside down? If I am in a room with 5 people and guess all their birthdays, what is the probability of getting (only) one correct? If you were to drill a circular hole in a sheet of metal and then heat the sheet, what would happen to the size of the hole? Please derive the formula for the area of a circle. Show the forces acting on a ladder. Talk about a light bulb. What are the main assumptions that we make when we model potential flow? What is Moore’s law and what limits the size of a computer chip? What is the strongest naturally occurring material and how can it be cut? What is the difference between a gun and a rifle and what advantage does a spinning bullet have? What is the significance of superconductors? What would be the difficulties with building a bridge that connects the UK and Canada? What would be your first invention? Why do large ships like aircraft carriers not sink despite weighing several thousand tonnes? Why do sausages split length-ways rather than around the circumference? Why do windmills never appear stationary? Copyright © 2019 Cambridge Interview Questions. All Rights Reserved. The Gridiculous Theme by bavotasan.com.